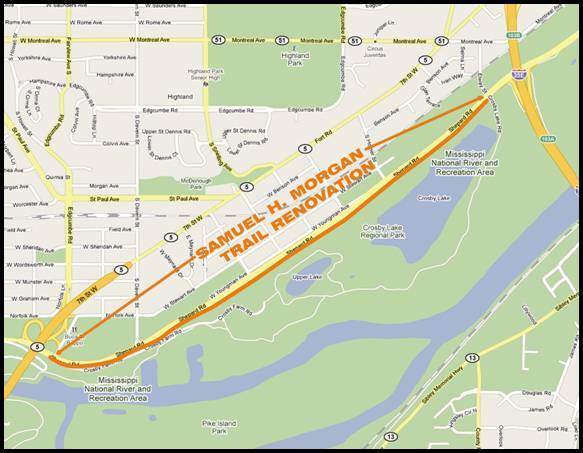 Construction was completed in early 2011 The Parks and Recreation Department will be renovating a 1.9 mile segment of the Samuel H. Morgan Regional Trail between Hwy 5 and Interstate 35E. The improvement project includes increasing the width of the trail and where there is available space, separating the bicycle and pedestrian paths. Addition of a trail lighting system. Construction of a small scenic overlook. Tree planting and installation of other landscape amenities. Improvements to the site drainage to eliminate several wet trail areas. Construction will begin on June 1st. The trail will be closed to bicycle and pedestrian use until the trail is re-opened in mid-August. Funding Project is funded with a combination of Federal Transportation Enhancement (TEA), American Recovery and Reinvestment Act (ARRA) stimulus funds and local matching funds from the Metropolitan Council and the City of St. Paul.